Bat House: April 1, 2017. People may have a misconception about their role in human life. 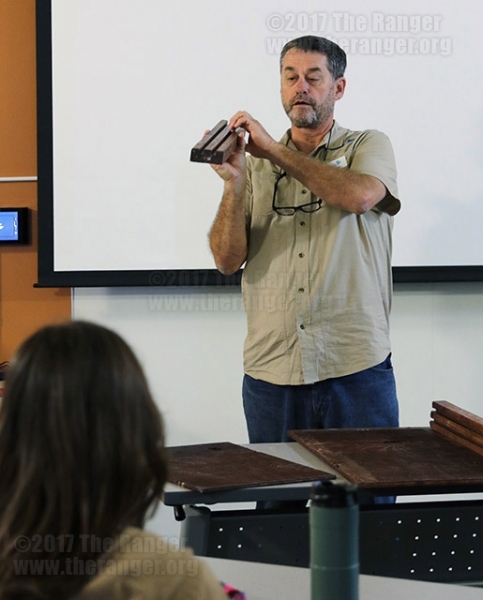 More than 1,300 species of bats worldwide play an important role in the ecosystem, said Fran Hutchins, director of Bracken Cave Preserve and member of Bat Conservation International, April 1 during a bat house-building workshop at Sinkin Eco Centro. Hutchins said most of Central Texas’s bats are insectivores. This type of specie is responsible for eating pest insects in this area, which help farmers save millions of dollars every year either in crop damage or pesticides they don’t have to buy, he said. “Worldwide, bats are important not just for eating insects, but also as pollinators —pollinating night blooming plants like cactus — and as seed dispersers for a lot of tropical plants,” he said. Hutchins said this area also has nectar and fruit eating bats due to migration from Mexico and the Caribbean islands. “The big one they like to feed from is the agave cactus, so we really need to keep the bats feeding from agave so we can keep the tequila flowing,” he said, joking. Joe Miller, culinary chef and purchasing assistant at the Culinary Institute of America, said this topic affects him because he is all about the produce quality and food safety. “We do not want pesticides on our plants because nowadays it affects the human kind,” Miller said. “It’s not good and it’s not healthy for our bodies, so the more organic we can go the better,” he said. Ursula Miller, A master’s degree candidate in environmental science at the University of Texas at San Antonio, said she is passionate about protecting this city’s natural resources. “I knew that we had bats in San Antonio, but I didn’t realize the many different species that we had, so that was nice to learn about,” Miller said. “I know bats are important pollinators and my research is actually focused on monarch butterflies — they are pollinators as well — so I thought it was really cool to see what I can learn about bats,” she said. Miller is doing a monarch butterflies project, in which she is also researching on their association with cardenolide in milkweed plants. This project will take her to Mexico to study the monarch butterflies’ migration path. Miller brought her husband to this workshop on a secret date. Hildi Mayorga, a neighbor of the area, said she likes to be knowledgeable about what is happening in her city and this type of workshop helps her with that. Mayorga is all for bat conservation because of the mosquitoes problem. She is always the one to get attacked by them, she said laughing. After the workshop, attendees had the opportunity to build a bat house with Hutchins in the Eco Centro’s garden. With a drill in hand, each of them participated by screwing the house kit and caulking the cracks. The result: a double-chamber wooden bat house. For better chances of attracting bats, Hutchins recommended staining instead of painting because of paint odor. He said darker colors would increase heat absorption, which can be good for cooler climates. Hutchins also recommended hanging bat houses on a pole above gardens and away from trees and walls to be free from predators and to act as a fertilizer since bat’s excrement is rich in nutrients. For more information on bats and how to build a bat house, visit www.batcon.org and www.lonestarwoodcraft.com respectively.